Tea is a wonderful beverage that has been enjoyed for centuries. While it's been shown to have a myriad of health benefits, there is one thing that does not benefit from long-term exposure to tea: your teapot. If you favor a traditional teapot made from China and have a love of the ancient beverage, you will eventually notice that the stains build up. It is inevitable and it won't be long before you also notice how hard they are to remove. While tea stains can be stubborn—perhaps even nearly impossible to remove—there is a simple and quick solution. With this ingenious trick, you can ensure that your China continues to look its best through many afternoon teas to come. To get your teapot or teacups back to a sparkling clean finish, you will need to gather a few simple items. The process of removing tea stains is not difficult, though it does require patience. You need to allow ample time for the denture cleaning tablets to do their work and clean the surface of the China. At a minimum, it will take an hour, though you'll find that stubborn tea stains may require an overnight soak. Be sure to leave plenty of time. Take the chill out of the pot or cup by rinsing it with warm water. Use very hot or boiling water to fill the teapot or cup enough to cover the stained area. Be sure that the hot water goes into the teapot's spout so it can be cleaned as well. For a teacup, cut a denture tablet into quarters and drop one piece into each cup. For a teapot, drop one or two denture tablets into the pot. Allow the tablets to work their cleaning magic for one hour. Check to see if the stains are gone. For very stubborn stains, leave the water and tablets overnight to give the solution longer to work. When the stains have disappeared, wash the teapot in hot soapy water. Rinse thoroughly with warm water to ensure all the cleaner is removed. Wipe the teapot or cups dry with a soft, absorbent towel. 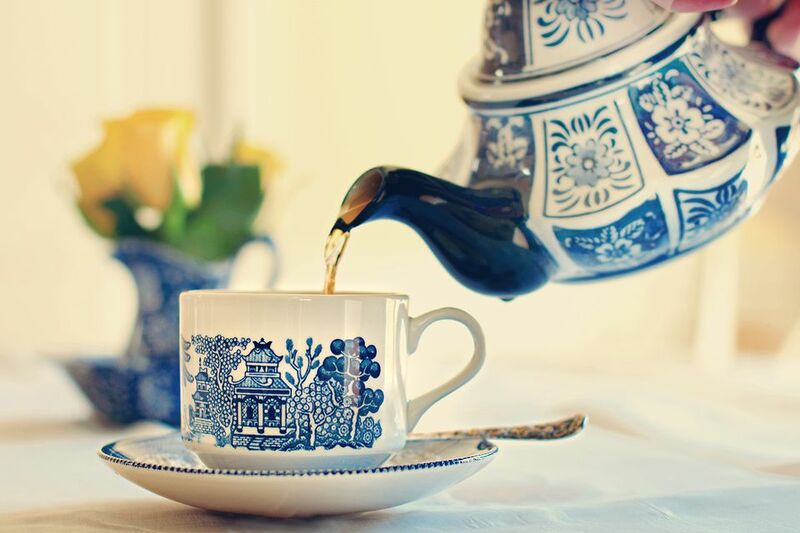 To ensure that you do not damage your tea set while cleaning it, there are a few important tips you'll want to keep in mind. If you have a very valuable or collectible teapot or cup, consult an expert before using any corrosive cleaner on the piece. Carefully wipe and air dry the teapot before you replace the lid and store it. It's often best to let it set out overnight to ensure all the water evaporates. If you have a particularly stubborn stain, try wiping it lightly with a soft damp rag dipped in baking soda. Rinse and dry.